The importance of logistics industry has been growing in cross and transport sectors plays a critical role in the advancement of trade and investment, and thus contributes toward economic development. 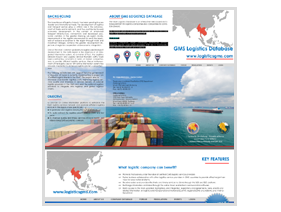 In the context of enhanced transport infrastructure, connectivity and developed economic corridors in the greater Mekong sub-region (GMS), improvement of the logistics are required to serve the openness of national economies to the region through trade and investment linkages, achieve the greater development objectives of regional cooperation and economic integration.One of the most common problems in logistics and transport development in the GMS region is the absence of an integrated information system. As a matter of fact, the Logistics Services Industry and Logistics Service Providers (LSPs) have been confronting constraints in terms of market competiveness of the logistics sector with online information system has become imperative to enhance logistics sector’s competiveness. The Mekong Institute (MI) with support from the government of Republic of Korea is currently implementing a project on ‘Certified Logistic Master in the GMS’. The project aims to decrease cross-border logistics costs, improving logistics services quality and timeliness in services delivery of national logistics providers in the GMS and assist the national logistics providers to integrate into regional and global logistics chains.The GMS Logistics Database is a part of the Logistics Development project to introduce an interactive web-based database platform for logistics companies with the mobile application system.